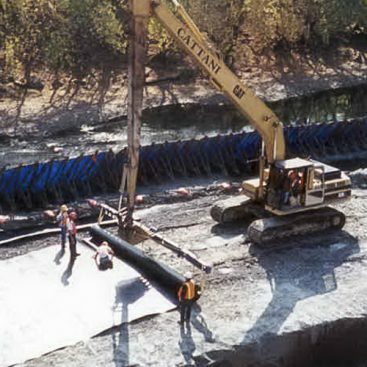 Geo-Solutions was subcontracted to install a soil-cement-bentonite stabilized soil barrier (SSB) around a former Manufactured Gas Plant (MGP) site. The site was occupied by an MGP facility from 1891 to 1960. The facility structures were removed around 1980, leaving the contamination typical of MGP facilities, including large amounts of coal tar, purifier wastes, and various volatile organic solvents. Following a NYSDEC Record of Decision (ROD), a Remedial Action Plan was prepared by The URS Corporation to address the removal of the contaminated soil and prevention of further migration of contaminates into the adjacent Saranac River. 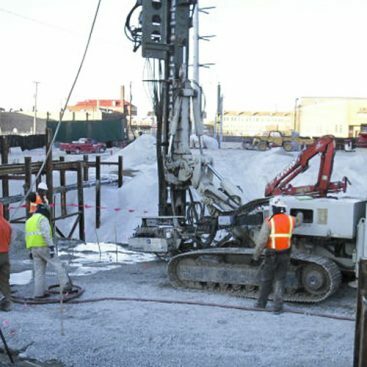 Geo-Solutions’ scope of work included the field sampling and performance of a treatability test program to address the varying site soils and high level of contamination and free product contained therein, and develop an appropriate mix design to meet the project performance criteria. Geo-Solutions collected a series of samples from around the site, which were characterized by soil type and level of contamination. From this characterization a series of samples were prepared to represent the most prevalent soil and contamination conditions around the site. These samples were mixed with candidate grout mixes and tested for Unconfined Compressive Strength and Permeability. From this data a grout mix was developed that could effectively treat the “worst case” site soils. Specified parameters were a 28-day Unconfined Compressive Strength of 40 psi and a permeability of 1 x 10-6 cm/sec. 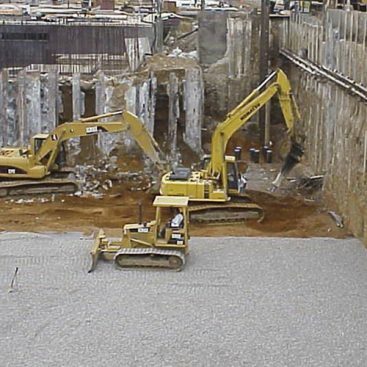 The 3,000 lineal-foot perimeter Stabilized Soil Barrier serves as a gravity retaining wall and hydraulic control structure to facilitate the excavation and disposal of the contaminated soils contained within the site. Geo-Solutions began the SSB installation using a series of overlapping auger-mixed columns installed using Geo-Solutions’ Calweld Drill Platform mounted on a Link-Belt crane. Columns were 12-feet in diameter and overlapped sufficiently to provide the specified 10-foot (minimum) wall thickness. Columns were up to 20-feet in depth and mixed one foot into the confining till layer. The SSB was completed on time and met the quality control standards originally set for the project. 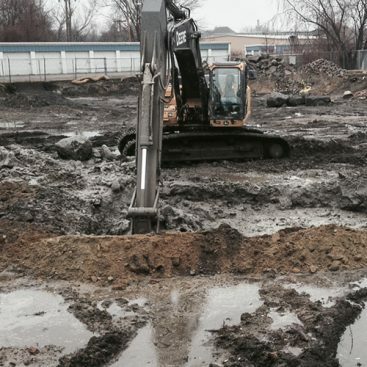 The project schedule necessitated the work be completed during the winter months. The harsh weather conditions typical of this region complicated the day-to-day site activities. Through “winterization” measures Geo-Solutions was able to maintain the functionality of the grout production and other equipment and complete the job efficiently.